136 Queen Street, Glasgow. G1 Tel: 01412219330. Over the years this old established pub has had many name changes in recent years it has been known as The Ingram Bar, Yates Wine Lodge and Drouthy Neebors, today the title above the door is back to The Ingram. There has been licensed premises on this site since 1916, landlord John MacKenzie Caldwell ran the public house until the end of the First World War. Another well known publican to run the Ingram was Donald MacLean who took over in 1944. The original Ingram Bar was located in Ingram Street, however the licence was transferred to it's present site on Queen Street when the old Ingram Bar was demolished. Interior view of the main bar, Ingram Bar. 1945. 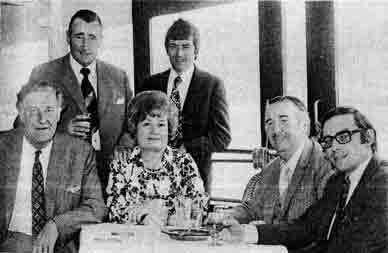 Donald MacLean was born on the Isle of Skye, when he came to Glasgow he worked in the kitchen of the Central Hotel, afterwards becoming a waiter there. He gained further experience in the trade at the Royal Hotel, Oban and Gleneagles Hotel and spent ten years in the Grosvenor Hotel, Glasgow. He then when on to own his own pub in 1938 at 339 Cathedral Street. The Ingram consisted of the main bar and small dining rooms. Jean Hannah an old lady that worked in the premises for many years was established as Secretary of the business. Mr MacLean had many interests, he was a member of the Glasgow Licensed Trade Defence Association, he took a keen interest in the Glasgow Skye Association, he also liked the works of Rabbie Burns and was a member of the Royalty Burns Club. During the war he served in the Clyde River Patrol. Exterior view of the Ingram Bar. Mr. A. M. Don (Dunn & Moore), past president, and Mr. A. Sutter (Buchanan Booth's Agencies) standing. Seated, Mr. A. Stewart (Buchanan Booth's); Mrs. E. Prosser; Mr. J. Brown (Ingram Bar); and Mr. P. Taylor (Albany Hotel). 1973. This photograph was taken at the annual outing of the "BEN" (Scottish Wine and Spirit Merchants' Benevolent Institution. 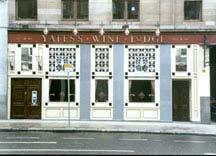 Also see Yates's, Sauchiehall Street. In 1978, Mr. Jack Brown, one of Glasgow's noted licensed trade personalities, for many years proprietor of the Ingram Bar, Queen Street, Glasgow, has died in hospital, aged 68. He is survived by his wife, one son, Jack, who runs the Shaws Bar, Westwood Road, Pollokshaws, Glasgow, and one daughter, Marlene. Interior view of the dining room, Ingram Bar. 1945. Interior view of the Ingram Bar. 1950s.